MONROVIA – It is becoming glaringly clear that the Coalition for Democratic Change (CDC) government under the leadership of President George Weah is in serious crisis with officials of the three branches of government at variance with each other for separate reasons. This paper has reliably learned that in addition to some misunderstanding within the Executive Branch, the five-member Supreme Court Bench is also divided on issues with two against three. This split according to some high-ranking officials very close to the Judiciary is because of attempts to “politically” impeach Associate Justice Kabineh Ja’neh. 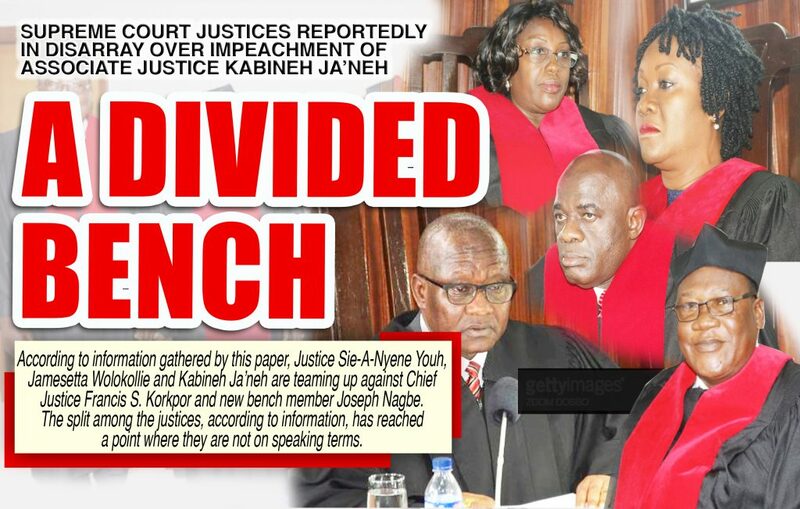 According to information, Associate Justices Sie-A-Nyene Youh, Jamesetta Wolokollie and Ja’neh are allegedly in one team, which is reportedly against Chief Justice Francis S. Korkpor and new bench member Joseph Nagbe on another side. This reported split among the Justices has reached a point where they are not on speaking terms. “This is a government in crisis; it is bad at the moment. If we are not careful this could get worse,” our source, who doesn’t want their name mentioned, said. This source further stated that the rift heightened recently when the Supreme Court gave the Legislature the green light to continue with impeachment proceedings against a bench member, Justice Ja’neh. Chief Justice Francis S. Korkpor, reading the ruling into the petition for a Writ of Prohibition on the Legislature, the Chief Justice said the House of Representatives had only made a request for impeachment and had therefore not commenced an impeachment proceeding for which a Writ of Prohibition must be issued. He described the petition as premature. Associate Justices Sie-A-Nyene Youh and Jamesetta Wolokollie, however, dissented with the majority’s opinion and they didn’t affix their signatures to the ruling. Despite news about a relative calm in the Senate, four members of the Senate recently took a decision against their colleagues to the Supreme Court on the way that body is proceeding with the impeachment. Notwithstanding this disagreement, they appeared relatively calm and working together probably that is why they are considered the “House of Elders”. In the House of Representatives, some of its members are at odds with the Speaker, Mr. Bhofal Chambers, who they accused of proceeding wrongly in the running of the House especially when it comes to making decisions that impact the Legislature. One lawmaker, who spoke to this paper on the basis of anonymity said, members of the House of Representatives and their staffs have not received salaries and benefits since October of 2018 while their counterparts in the Senate are regularly receiving their benefits and salaries. A leaked memo from the House of Representatives, a copy of which is in the possession of FrontPageaAfrica, uncovered US$1.25 million of the national budget being diverted to private clinics and health centers own by some representatives and other officials of the government. This alleged diversion was done by members of the Ways, Means and Finance Committee of the House. Representative Thomas Fallah (CDC-District #5) Chairman of the Joint Legislature Budget Committee claimed to have no knowledge about the information. In the memo dated October 15, 2018 aggrieved members of the Ways, Means and Finance Committee wrote House Speaker Bhofal Chambers expressing shock and regret about the manner and form in which the entire 2018/2019 budget process was conducted, beginning with the committee room on ward to the printing into handbill. Since he received the compliant from the aggrieved representatives, it is believe that the House Speaker has failed to investigate even though he promised to do so. However, his allegation against the Vice President was quickly debunked by the leadership of the NPP. John Gray who was acting as chairman of the party termed Biney’s assertion as “ludicrous” and “diversionary”. President Weah as the head of the ruling coalition is yet to comment on the matter unfolding within the NPP.